Staying hygienic is important to the overall health of an individual. The following are ways to substitute everyday hygienic practices and materials to eliminate the ingestion of unnecessary fragrances or chemicals. 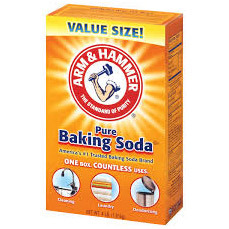 Baking soda is a natural deodorizer and isn’t just for baking! It is a fantastic dry shampoo. For those suffering from excess grease, the baking soda absorbs it all, leaving you with a freshly scented head of hair. Baking soda can also be mixed with a favored essential oil for an all natural non-allergenic laundry detergent. 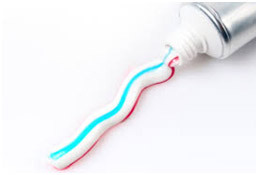 There is an exuberant amount of unnecessary additives in name brand toothpaste. Those additives include sweeteners such as sorbitol, fluoride and triclosan. Although fluoride is considered “controversial” by most, there is a known effect of suppression on the thyroid hormone uptake. An alternative home recipe involved the mixture of coconut oil and you guessed it, baking soda! Generally you would use about 2-3 tablespoons of baking soda per half cup of coconut oil, mix thoroughly. Dish detergents are another home product using unnecessary additives that could be detrimental to the overall health of the people using it. 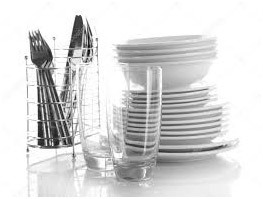 Mixing the ingredients of ¼ cup of baking soda and 2 cups of warm water then, adding a tablespoon of apple cider vinegar and about two tablespoons of lemon juice is an amazing homemade dish soap recipe for glass and silverware. Add a little more apple cider vinegar and lemon juice to the mix for tougher grime on dishes. Being conscious of what we put into our bodies is an uplifting perspective into the eyes of our body and mind. 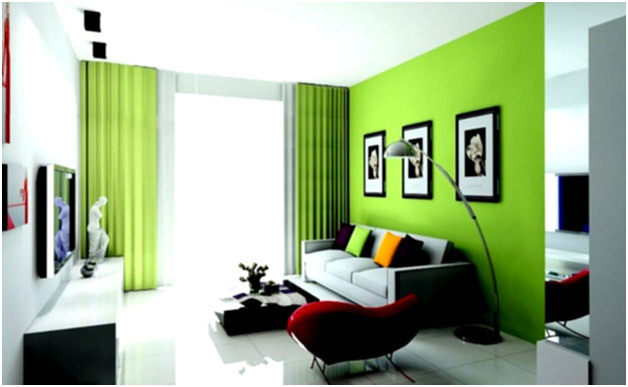 One of the simplest ways to give your home a sleek and modern look is starting with the basics and working your way from there by adding colorful accents. 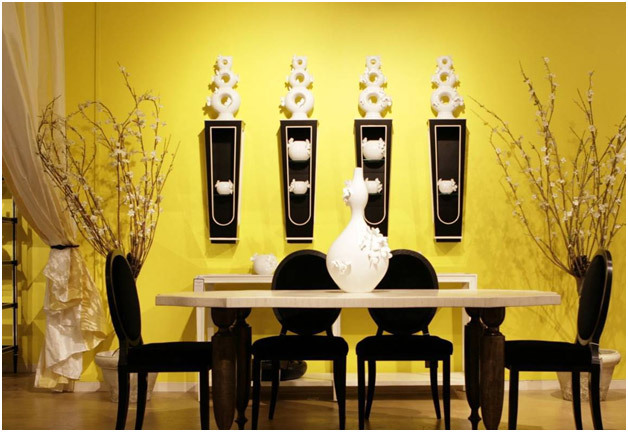 Start with a chic black and white motif for your main furnishings. 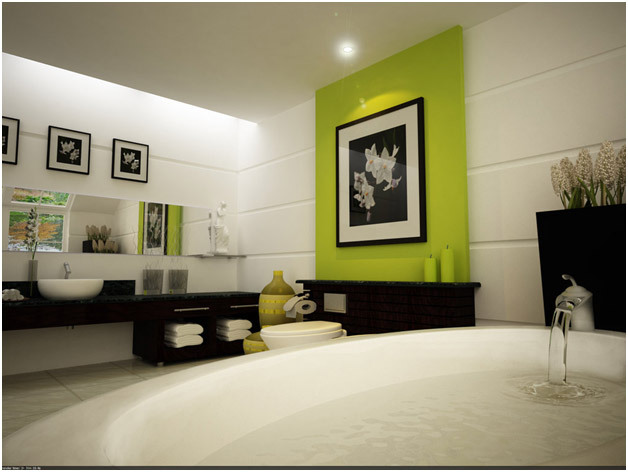 Next, you can add silver clocks and large mirrors providing light and space to the design. 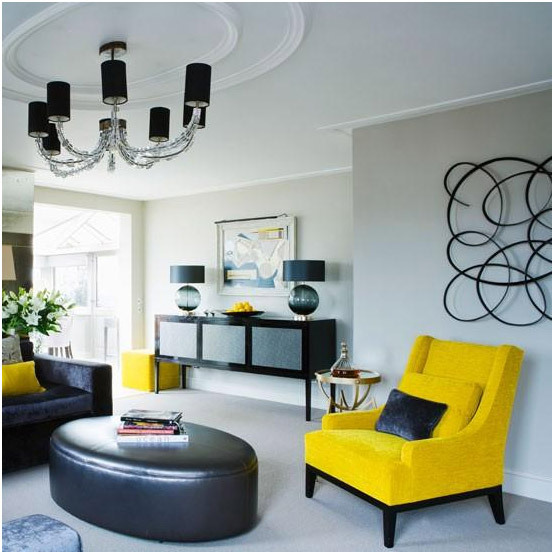 By keeping the design simple, you have freedom to add whatever bold, bright colors or eccentric and intricate patterns in the form of rugs, pillows or vases to your design. Black and white motifs are like real-life coloring books, where you get to add in all the beautiful details! 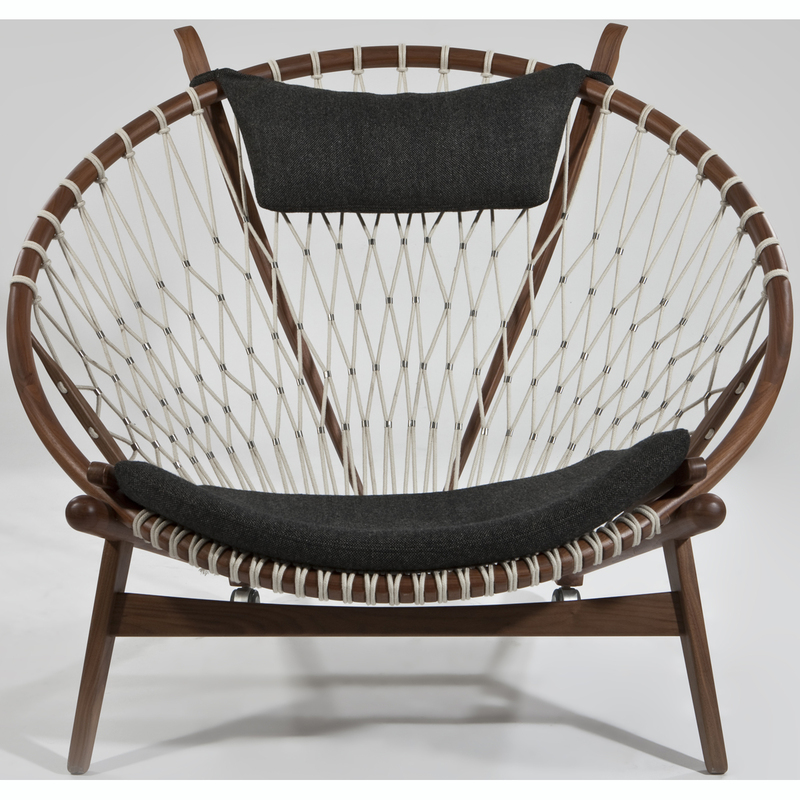 This stylish and innovative Hans Wegner Hoop Chair is a beautiful representation of mid-century modern danish design. The Hans Wegner Hoop Chair adopted its name from its designer, Hans Wegner. Wegner was a danish furniture designer that created his designs in with functionality and human form in mind, this style was called “organic functionality.” The idea was to create interior furnishings that were ultra-comfortable, shaping themselves to adapt to the human form while also having features that made them highly useful for whichever purpose they served without compromising aesthetic. 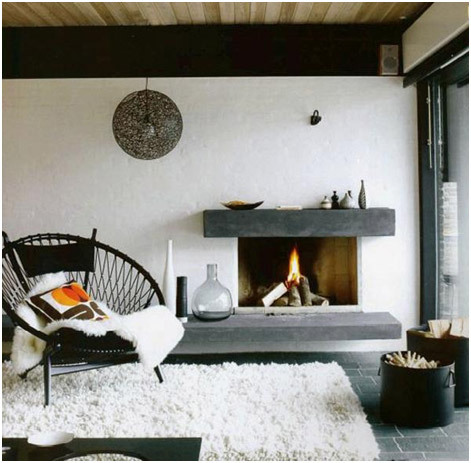 It comes as no surprise to see how the Hans Wegner Hoop Chair would encompass these qualities. The Hans Wegner Hoop Chair has a unique, circular shape with a sculptural appearance. It features a contoured designed made with natural materials. Aside from its physical appearance, which would look nicely in contemporary, modern and rustic interior design motifs, it’s built in a way that enhances lifestyle. 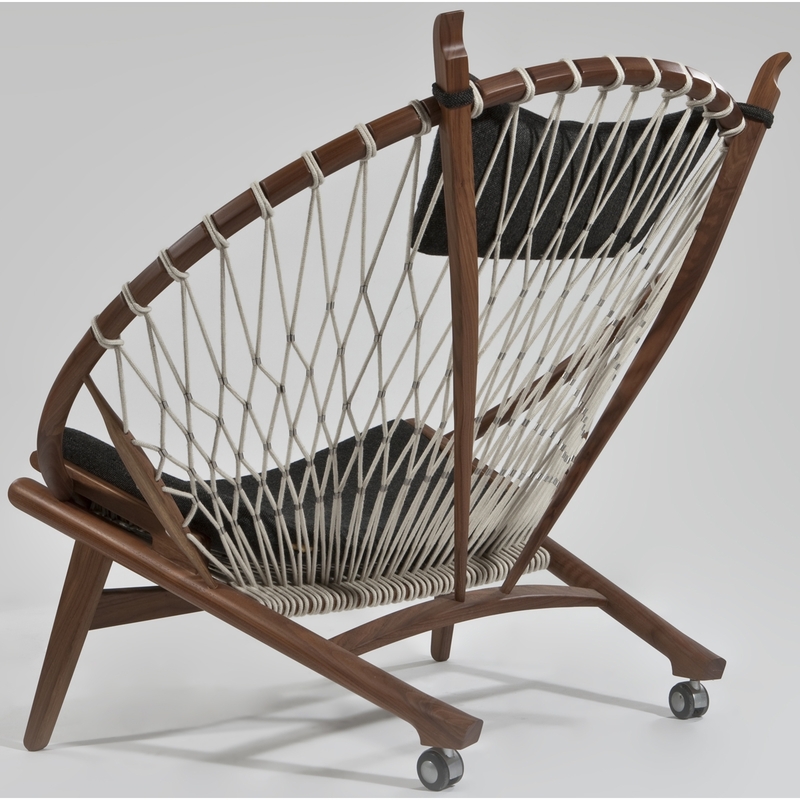 Its solid wood frame is sturdy and stable and the backrest is made of naval rope that cradles the body. The headrest features a soft cushion while the seat features a plush, concave cushion. These features provide superior comfort and durability if used frequently. Additionally, the back legs conveniently have wheels, making it a mobile lounge chair! 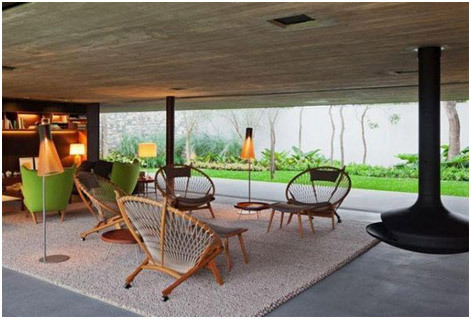 Highly accurate reproductions of the Hans Wegner Hoop Chair, in a variety of fabrics, colors and wood finishes, can be purchased by trusted sellers of mid-century modern and contemporary home furnishings. Bring harmony and balance to your bedroom and sleep cycle by following some simple ways from a metaphysical and physical perspective. Do not have the head of your bed against a wall that shares a wall with a bathroom or a kitchen. The draining of the water is said to promote a draining of your energy especially when used in conjunction with sleep where your mind and body is more relaxed and vulnerable. If you have a space that does not give you a choice but to have your beds head sharing a wall with a bathroom or kitchen, then make sure you have a bed headrest. Bed headrests create a “mini” wall or barrier separating the actual bed from the shared wall. This is also why some feng shui practitioners suggest keeping the lid on the toilet seat closed and the bathroom door shut at all times. 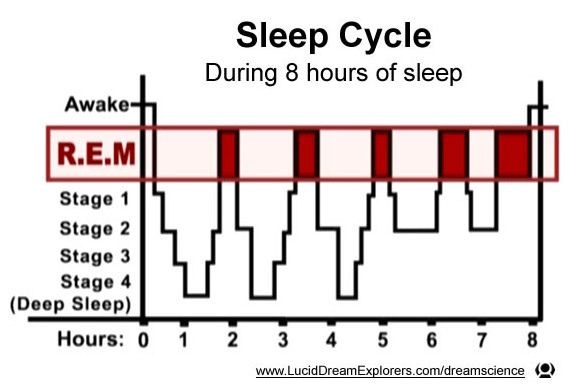 For those looking for a more practical reason – the frequent running water through the pipes or general bathroom use during the night creates sound whether fully waking you up or not which unsettles the natural REM cycles we experience as human beings to achieve the best sleep we possibly can. Never have mirrors facing you while you sleep. If you are in bed and you can see yourself in the mirror, then you need to move the mirror or the bed. On a metaphysical level, mirrors are said to be portals to other worlds that work both ways. Thus, when in the vulnerable state of slumber, you wouldn’t want anything or anyone to see you on the other side! However, on a more practical note, mirrors reflect light, you are a source of light, so whether or not you are actually directly looking into the mirror or pointing a light source at it, the mirror creates the illusion of light and space. The less light and the cozier the space when you sleep the better for our natural rem cycles, also simulating the mothers womb. Never have your feet facing in the direction of a door while you are lying and/or sleeping in bed. This is especially true for the main or bedroom door, but could also affect you if feet are pointing towards a bedroom closet door. The ritual way dead bodies are carried in caskets to and from their locations during funerals is always feet first. The feet pointing towards an open doorway symbolically represents this corpse position and some people have described having strong feelings of anxiousness or panic attacks and night terrors as a result. No electronic or digital lights and devices. If you can remove all electronic devices from your bedroom, do it! You will be amazed at how all that background buzzing you could hear and even the buzzing you cant perceive with your ears is having an affect on your mind and body while you sleep. You will feel calmer and more relaxed without all the stimulation from devices you arent even directly interacting with. If you cant remove the devices, then at least unplug them from their electrical source as this is where their primary energy is generated from – plus it helps save on electric bills too! Using mirrors to expand space and lighten a room has been a design trick for centuries. The portal mirror effect is a whole new clever and creative use of mirrors. Its very simple! 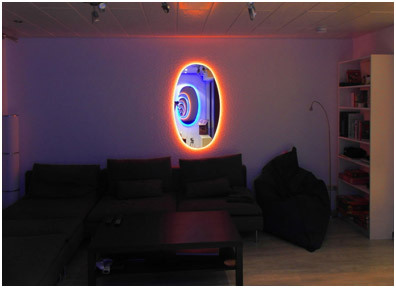 All you need are two mirrors, oval and round mirrors work best and led lights. 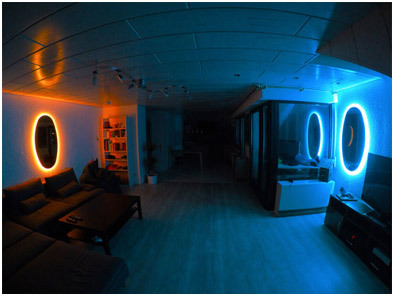 You can get LED lights in whichever colors you want, this designer chose orange and blue. Place each mirror on opposite walls of your room facing one another. Place LED lights around perimeter of each mirror. It may take a few attempts when placing their mirrors to ensure they are angled properly to give the effect of several layers of glowing mirrors moving through them. Once you set it up, watch as your room transforms into magical space where anything can happen, even jumping through dimensions! Bring Some Flavor into your Interior! Want to add a little flavor to your interior design motif? 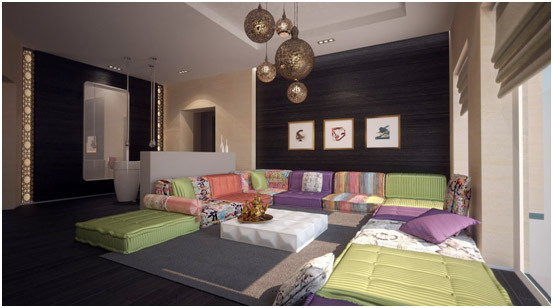 Spice it up with Moroccan style by using bold colors and unique patterns and shapes to brighten your living space. 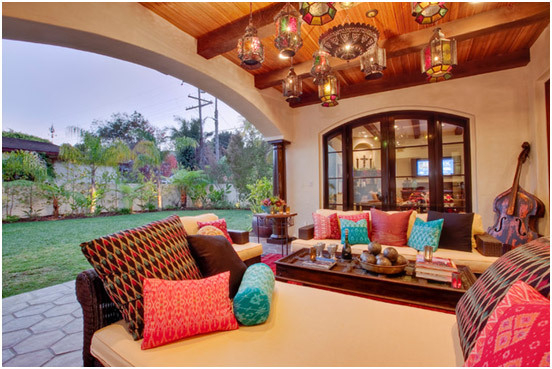 Low hanging lamps, lanterns and sconces with ornate details and comfortable, communal seating that sits lower to the ground with plush pillows is one way to add this style into your home. 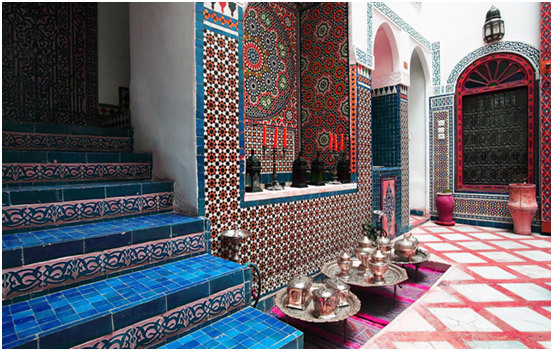 Mosaic tilework or painted walls with geometric designs is another distinct feature to moroccan design and allows for simpler decor while still staying true to the flavor. 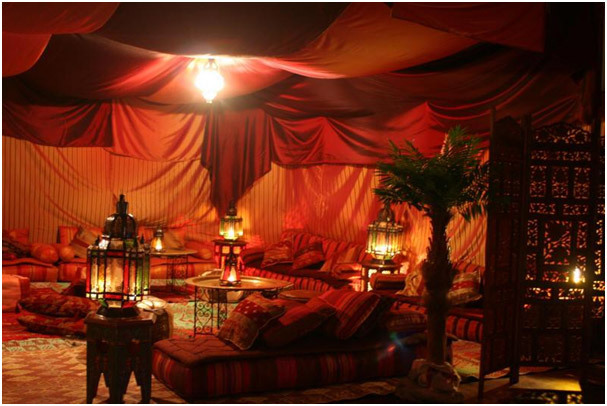 Using jewel-toned flowing fabrics loosely over the walls and ceilings creates a desert tent like appearance and when used in combination with lighting casts unique shadows throughout the interior. Not a lot of time on your hands? 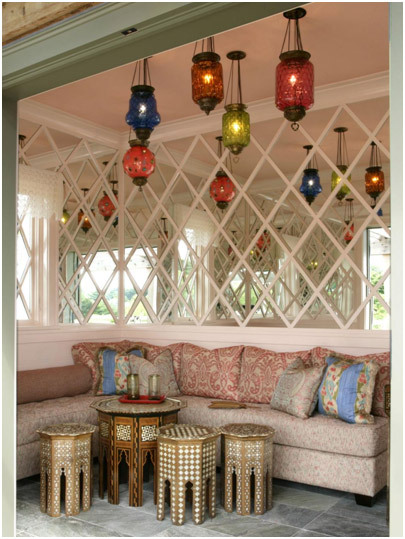 You can even take the route of simply purchasing decor and furnishings in Moroccan style which are usually hand-painted or intricately crafted and serve as totally functional works of art in your home. Whether you are choosing to take your entire home or just one room in the house into a full-on North African oasis, it will serve as a luxurious sanctuary to rest and relax solo or with family and friends for years to come.